Today is the worst day of the hot spell. Advisories to stay inside are on the news its in the mid 90’s with the heat index well over 100. Everything is still outside. I will be glad when this heat wave will be over. These just showed up in the yard some years ago, I have left them alone in the spot near the road, this year the neighbors who picked them all last year have moved and there are plenty of them. I seriously need to weed them and get them organized this fall. I am going to freeze what I have picked and enjoy them on my cereal on a cold winters morn and remember that I picked them on this very hot day. 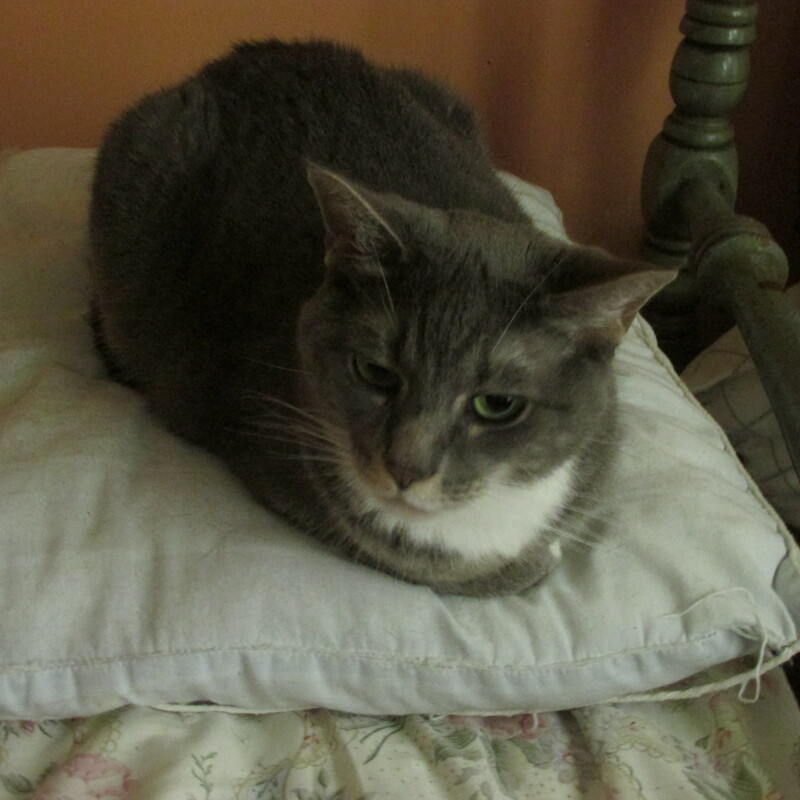 Lilly Pad is enjoying the air conditioner as much as I am. I have been getting this magazine since the early 90’s. I just love it and the world stops for me and I sit down with it and a cup of tea when it arrives. My subscription ran out in December and I didn’t have the extra to renew till the spring so my first copy came today. Yes, its pricey to get here in the states. But if I only could buy one magazine it would be this one. You might wonder just why I love it so. It’s about what I am about. There is information in every issue about the things I love, sheep, farmers, chickens , dogs and cats, gardens, knitting projects Ireland, England, Scotland how to make jam, decorating , and on and on. I first met Emma Bridgewater’s pottery there and was give a cup and saucer shortly thereafter, I treasure it. Though I have just skimmed through this issue there is an article about one of my favorite places in this world, Donegal, Ireland a place where I feel more at home than anywhere . 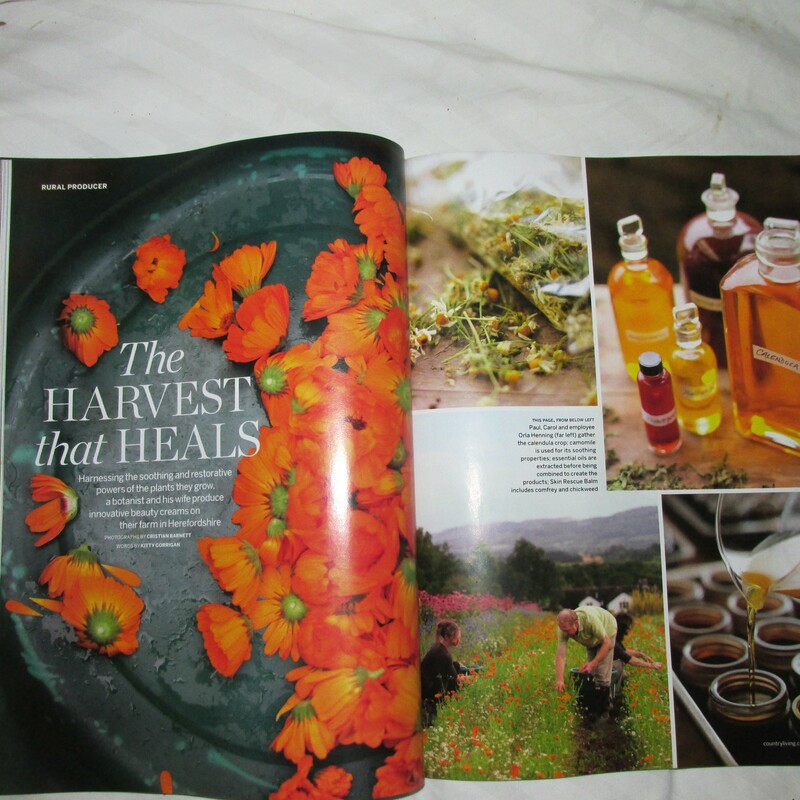 Another article is about Calendula which I use in my salve. You can pick up this magazine at most large bookstores in the states and in the EU and England at your local newstand or market. So far the animals are doing okay in the hot weather. The fan in the barn really helps the sheep. I have fans scattered around the house for the cats. Usually the downstairs of my house is cool but in this hot spell everywhere is hot. Chris will be here on Sunday after a week of Boy Scout camp at the coast of Rhode Island. Lilly Pad and I will be glad to see him. 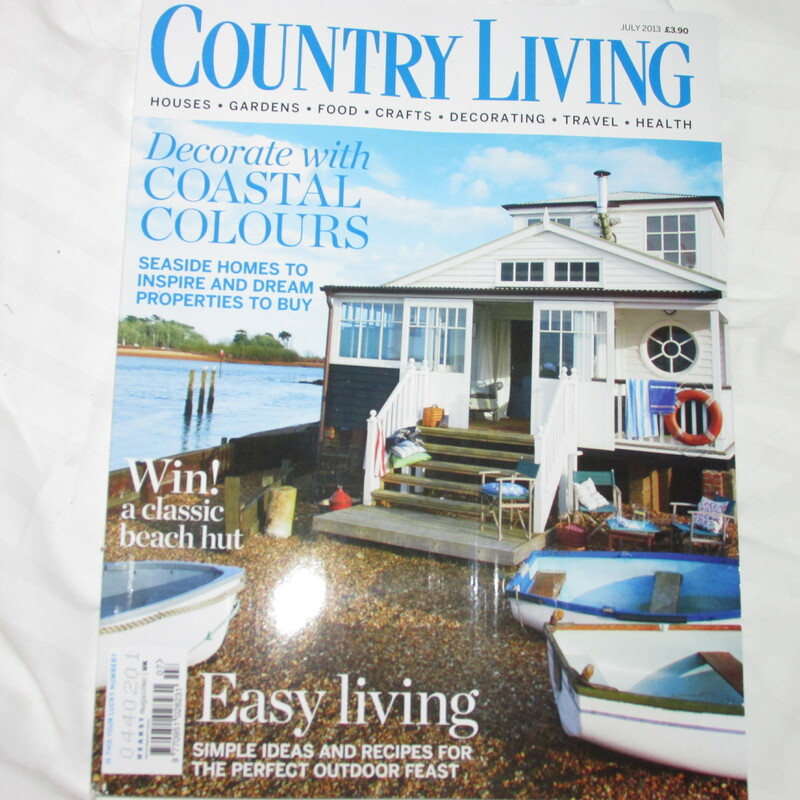 I love Country Living Mag. too, hadn’t thought to subscribe from the US, though… will have to look into that. And watch out for what I now call “those damn blackberry vines”, they will sprout all over your area and they are really tough to pull out. You did a great job doing your blog entry on such a hot day, all I did was stick in a few garden flower photos! So glad you are keeping cool. The raspberries look delicious! Like your good self, Carole, I have been reading and loving Country Living for decades now! it is the only magazine I have bought consistently over time! 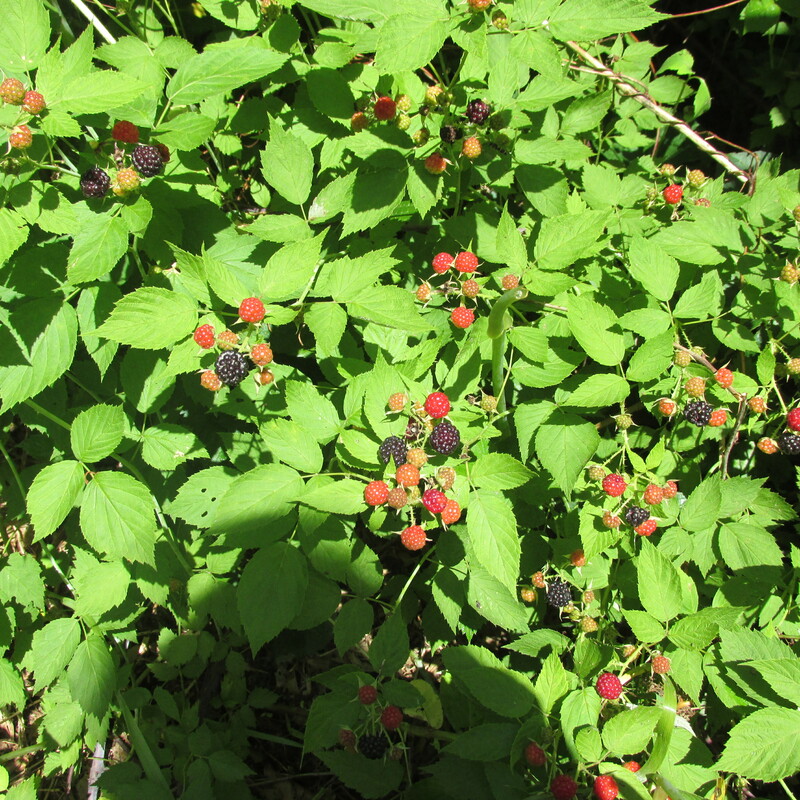 The fruit looks like Blackberries…are there any thorns on the stems? Yes, there are thorns but they are easy to pick/ They send out roots and the next thing you know they are all over the yard. 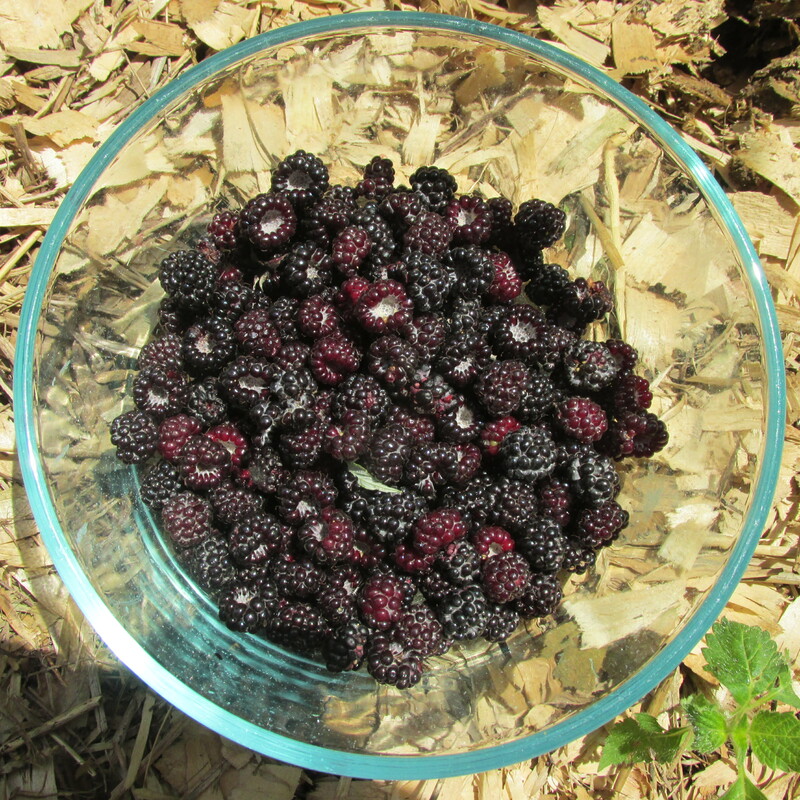 am now trying to grow them in just one place WHen that is done they are big and hardier berries.